It seems like soybean aphid populations have been creeping up and I understand a few fields have been sprayed. When we get to this time of year economical soybean aphid management is not easy. For every “no brainer” decision we get there are 100 “head scratchers”. Several factors to consider are crop stage, aphid numbers, how long they have been feeding, wheel track injury, cost of production, beneficial insects and pathogens……. the list goes on. The economic threshold (250 aphids/plant on 80% of the plants from R1-R5) is a conservative estimate. You will not have yield loss at that point solely as a result of aphid feeding. When crop prices were high several people were asking about lowering the economic threshold. The same answer holds true now. The economic threshold is an arbitrary number. It doesn’t change. Its intent is to provide a cushion for crop advisors to use to prevent aphid populations from reaching the Economic Injury Levels (EIL, approx. 600-700 aphids/plant) which is the point where economic loss can occur. What does slightly change with crop prices is the EIL. With low crop prices that number goes up. Frankly, continuing to use the current Economic Threshold gives you even more cushion and perhaps more time to observe populations trends before a spray decision is reached. Crop stage also has an impact on our decision. I like to think in terms of “preventable yield loss”. That is the amount of yield my decision can impact. I can’t resurrect what has happened in the past but more to the point, for this article, is how much yield is “in the bank” and how much is unprotected. The amount of unprotected yield decreases each day/week as the crop advances. In other terms, the later the growing season gets the less likely we are to make good economic spray decisions on marginal aphid populations. “White dwarf” soybean aphids are important to look for at this stage in time. White dwarfs should be included in all counts. However, they can have an important negative impact on future aphid populations. White dwarves are cream-colored, smaller in size and can be found on the lower soybean foliage. However, they do not live as long (50%) and their reproductive is about 70%. 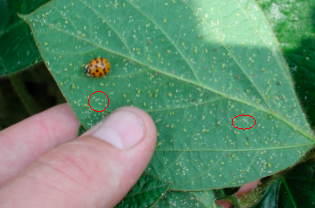 Both important impacts on soybean aphid reproductive rates as well as your recommendation. Later during the growing season, you are more likely to get help from beneficial insects and insect pathogens. Make sure you have some handle on their role (if not potential role). Insect pathogens can be hard to predict but beneficial insects are more visible. An important concept regarding the use of Economical Thresholds is that the pest population is increasing. Beneficial organisms can certainly impact the population curve. An extreme example would be if we sprayed an aphid population that reached the Economic Threshold today but the aphid population would have naturally crashed in 5 days would we have gotten a return on investment from that insecticide application? Likely not. As I mentioned in last week’s article, a spray decision can impact spider mite populations. Especially if the insecticide used is weak on mites. In that situation the beneficial insects are killed and you could potentially have a resurgence in both aphids and mites. Also, insecticide resistance can be a result of increased insecticide use. 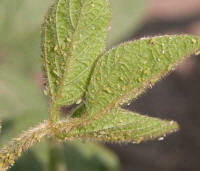 I am not aware of any soybean aphid resistance issues in our state but if you have a concern please contact the DATCP Pest Survey Program (krista.hamilton@wi.gov) to have aphids sampled and tested.